Medicaid fraud investigations encompass both recipient fraud and provider fraud, and can be conducted by several different government agencies, including the Office of the Welfare Inspector General, the Office of the Medicaid Inspector General, Health and Human Services Inspector General, and the F.B.I. 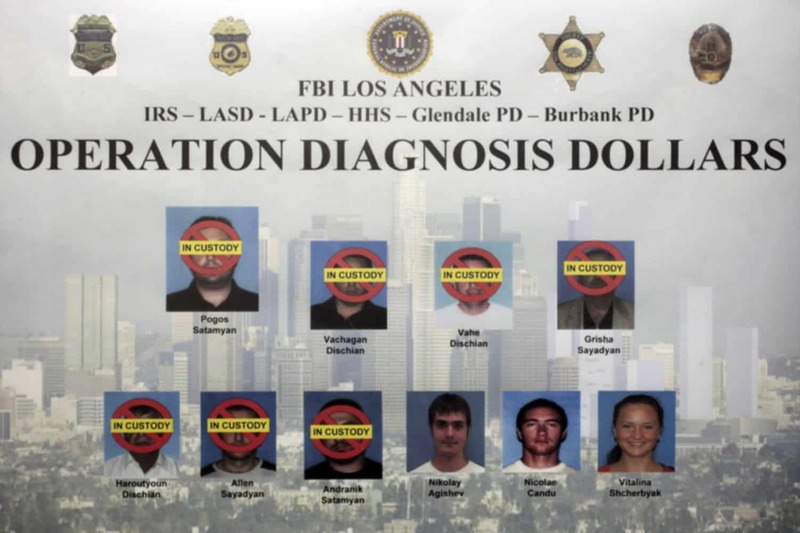 Medicaid Fraud Investigations- This composite photo released by the FBI Oct. 13, 2010, shows 10 suspects indicted in Los Angeles as part of an FBI investigation, dubbed Operation Diagnosis Dollars, which targeted the largest Medicare fraud ring by one criminal enterprise in the program’s history. Medicaid fraud investigations concerning recipient fraud can start off with something as simple as a letter asking you to bring certain documentation regarding your Medicaid benefits to an interview. You may even get a phone call asking you to come in for an interview, or you may just get a knock on the door. In any case, you will want a Medicaid fraud lawyer with you when you are subject to any questioning by the authorities. Medicaid fraud investigations concerning provider fraud are more complex than recipient investigations and often involve several agencies. This type of fraud investigation usually involves doctors, dentists, hospitals, nursing homes and pharmacies, to name a few. It can be triggered by an audit of of prescriptions from a pharmacy, an individual arrested on an unrelated incident gives the information as part of a deal, or a Whistleblower Lawsuit filed with the government, to name a few. A criminal defense attorney specializing in Medicaid fraud can and should be your first line of defense against such an investigation, and it is highly recommended that you contact an experienced lawyer in this field the very first time you are contacted by any of the above mentioned agencies for any reason. Medicaid fraud investigations can be serious business, often resulting in jail time for the targets. If you have been taken into custody for provider fraud, the authorities already have enough evidence to put you away! They are just looking for some “icing on the cake” in the form of a confession. From the second you are asked the first question by an investigator, the only thing you should answer is that you need to call your lawyer.